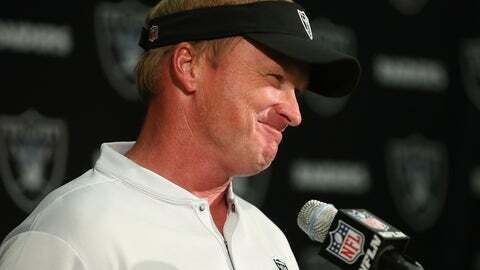 ALAMEDA, Calif. (AP) — The good feeling from his first coaching win in nearly 10 years wore off quickly as Jon Gruden went back to work Monday. Gruden knows there’s plenty of work needed to get the Oakland Raiders to the level he hopes they can reach as even their first victory of the season came with some flaws. The defense allowed seven plays of at least 20 yards, Derek Carr threw two more interceptions and the Raiders needed a thrilling comeback before prevailing 45-42 over the Cleveland Browns on Sunday. Next up for the Raiders (1-3) is a road game against the Los Angeles Chargers that already has Gruden concerned. It’s just a lot more enjoyable to do it after a win for a change. There were plenty of positive developments that the Raiders hope to build on for the future, starting with a defense that had four takeaways, including one returned for a touchdown; two good punt returns from Dwayne Harris that set up scores; and a clutch performance down the stretch from Carr, who bounced back from two early interceptions to throw for 437 yards, four TDs and the game-tying 2-point conversion. Carr had plenty of help on offense despite several drops from his receivers, including what should have been a long TD to Bryant in the first half. Amari Cooper had eight catches for 128 yards and one touchdown, Jared Cook had eight catches for 110 yards and two TDs, Jordy Nelson caught the game-tying 2-point conversion, and Jalen Richard had an 18-yard catch and run on the game-tying drive. But the best performance of all might have come from running back Marshawn Lynch, who rushed for 130 yards in his most productive game since 2014. He forced 11 missed tackles against the Browns, according to Pro Football Focus, and might have had an even bigger day if not for a quick whistle that negated a long run when the officials wrongly ruled Lynch had been tackled. NOTES: CB Daryl Worley returned to the team after serving a four-game suspension for violating the league’s substance-abuse and personal-conduct policies. He can resume practice on Wednesday but the team has until later in the week to put him on the active roster. … LG Kelechi Osemele and RT Donald Penn both left the game with injuries and Gruden didn’t have any additional information on their availability this week.